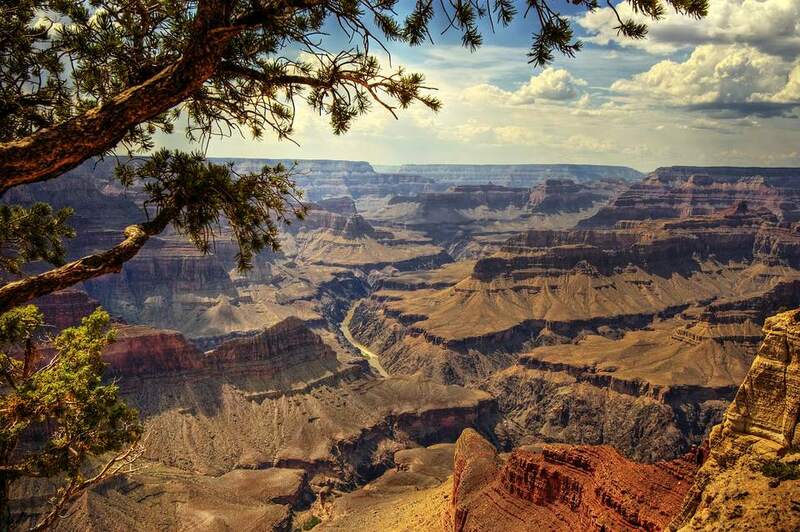 Where to Stay: Whether you want a comfy bed or a campsite, the Grand Canyon has many options. Mather Campground, located on the South Rim, has accessible sites upon request. But if you are looking for something cozier on the South Rim, try the El Tovar Hotel, Maswik Lodge, or Yavapai Lodge. On the North Rim, the Grand Canyon Lodge is a good option, though there are many stairs and some cabins do not have roll-in showers, so keep this in mind when booking. Amenities: Wheelchairs may be checked out in various locations, including: North Rim Visitor Center; Visitor Center at Canyon View Information Plaza; Yavapai Observation Station; and Desert View Bookstore/ Park Information. Free shuttles services are also available to help visitors get around the park. Beaver Meadows Visitor Center/Park Headquarters: Auditorium, ranger talks, and bookstore. There is also one backcountry area that is accessible - Sprague Lake Camp. The camping area will accommodate 12 people and is moderately accessible with a vault toilet, picnic tables, and fire ring with grill. Reservations must be made for Sprague Lake Camp and a backcountry permit obtained; Call the Backcountry Office at 970-586-1242. Amenities: The Estes Park Quota Club has wheelchairs and other hospital equipment available for loan. Arrangements can be made by calling the Estes Park Medical Center at 970-586-2317. A small, refundable deposit is required on all equipment. Yosemite Art Center: Art classes are offered during the summer and fall. Call 209-372-1442 for more information. Where to Stay: Three campgrounds in the Valley offer accessible campsites, suitable for wheelchairs: Lower Pines, Upper Pines, and North Pines. Specific sites have accessible fire rings and picnic tables with extended tops. Electric power to charge a wheelchair can be found at Lower Pines. Other options include the following lodges/hotels: The Ahwahnee, Yosemite Lodge, Curry Village, and Housekeeping Camp. Amenities: Manual wheelchairs and electric scooters can be rented at the bicycle-rental stand at Yosemite Lodge and Curry Village. Reservations are suggested and can be made by calling 209-372-8319. Free accessible shuttle buses also run in several areas of the park and have wheelchair lifts and tie-downs. For more information, call 209-372-1240. Where to Stay: Sol Duc Hot Springs Resort has accessible hot spring pools, rental cabins, restaurant, and lodge, so it’s a great place to stay. Lake Crescent Lodge is also a good option, equipped with accessible rooms, restaurant, and lounge. There are several options to camp, including Altair, Elwha, Fairholme, Heart O' the Hills, Hoh, Kalaloch, Mora, and Sol Duc. Amenities: Wheelchairs are available for use at the Hoh Rain Forest Visitor Center, which also has great exhibits, as well as the Living Forest Trail. What to See: Glacier National Park park has done a lot to accommodate disabled visitors. Goat Lick: an exposed riverbank where mountain goats and other animals come to lick the mineral-laden cliffs. McDonald Falls: At the end of the trail is a hidden gorge. Running Eagle Falls: A beautiful attraction that issacred to the Blackfeet (Southern Piegan) people. Where to Stay: Accessible lodging can be found at the following lodges: Glacier Park Lodge; Lake McDonald Cabins; Lake McDonald Lodge; Many Glacier Hotel; Rising Sun Motor Inn; Swiftcurrent Motor Inn; and Village Inn at Apgar. Apgar Campsite, Avalanche Campsite, Fish Creek Campsite, Rising Sun Campsite, Sprague Creek, and Two Medicine Campsite are also options for those looking to camp. Amenities: Fully accessible Visitor Centers, and a fantastic shuttle service that allows for easier transportation. What to See: Not only is Great Sand Dunes National Park and Preserve accessible, it offers the most unique things to do! Where to Stay: If you’re a camper, check out the backcountry at Sawmill Canyon. The site’s facilities include an elevated tent pad, an accessible picnic table, a fire grate, firewood and food storage containers, and an accessible privy. Pinyon Flats Campground is also an accessible place to stay with great restrooms and trails. The Great Sand Dunes Lodge and Zapata Ranch also have accessible options. Amenities: The sand wheelchair is a cool option that allows visitors to fully experience all aspects of the park. You can reserve a wheelchair in advance by calling the Visitor Center at 719-378-6399. Find the Best Indoor Water Parks in Every Part of the U.S.